Last night was date night for my husband Carl and me! I decided to surprise him with a special night of indoor camping! I found these cute printables at Free Pretty Printables and edited a few on Microsoft Word. When he got home, he found signs directing him to our campsite. Of course there wasn't any cell phone reception that far out. 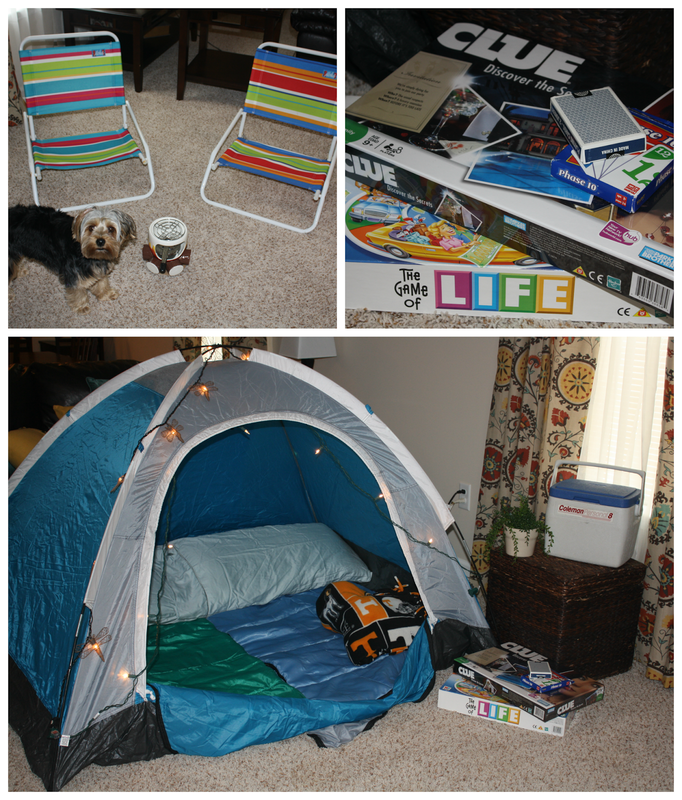 I decked out our living room in camping gear! Tent, sleeping bags, cooler, fire pit, and games! What more could you need? Missing the sound of nature? You can find hour long videos on YouTube with the sounds of nature and a scenic view of a river with water running. Looking for a lighter version? Using Annie's Organic honey grahams, 1 marshmallow, and a tablespoon of toll house dark chocolate chips. 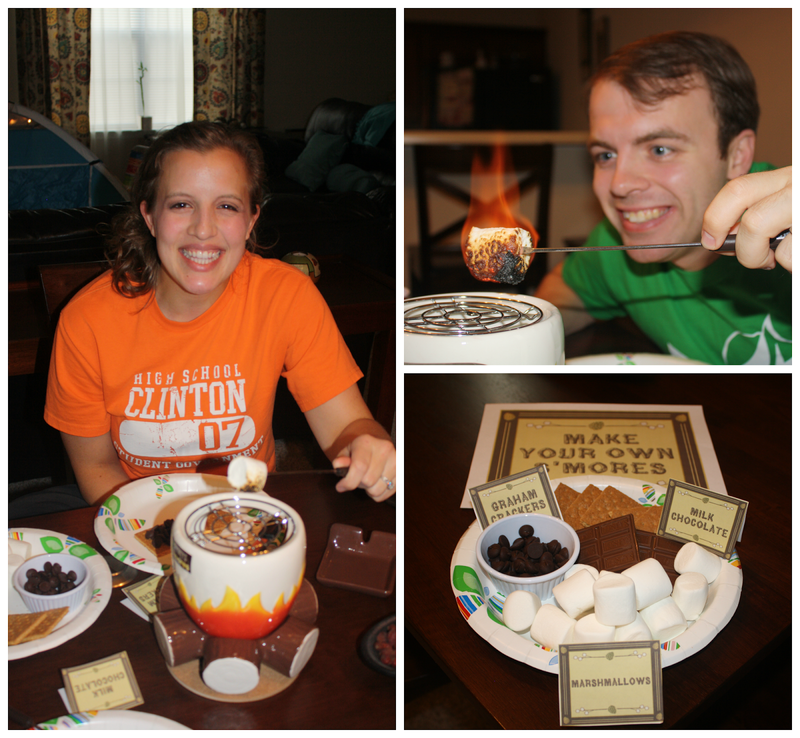 We finally got to use our Hershey's S'more maker we got last Christmas! Don't have a S'more maker? Try a s'more recipe! There's also grilled s'mores. Don't worry - we moved the S'more maker to the table! Catching our carpet on fire wouldn't have been a good end to the night. The night's entertainment? Games and a movie (that's the beauty of indoor camping). Even Maggie enjoyed camping! She especially liked hanging out in the tent. We may have disregarded the S'more maker instructions about NOT catching marshmallows on fire. But burnt marshmallows are SO good! Awww, thanks! It was fun to do. I enjoy the blogging, too. You are so cute, I love this idea! How fun! I am pinning! And thanks for your sweet comment on my blog! Thanks! It turned out to be a really fun date night! I loved your serving tables, they would be perfect for a party or small group! Oh my goodness this is awesome! Kinda wish I was dating you :P Looks like you guys had a lot of fun - I might have to try this in the future! Haha,thanks! My husband really enjoyed it - you should definitely try it sometime! It made for a fun and inexpensive date. What a great idea! I have been telling my kids we can't set the tent up in the living room but I guess I was wrong. I love the pictures too! Thanks! It was fun. I don't love outdoor camping, so this was right up my alley! I had to move the coffee table push the couches back a little, but it was worth it! Allison: What a thoughtful night you planned out and Maggie provided the "wildlife." The other night we thought about doing fire pit hot dogs and marshmallows in the backyard, but it got so hot. I was so disappointed about not being able to make flaming marshmallows. I've never seen that indoor s'mores maker. Looks like just the ticket! Gonna tweet and pin this. Have a lovely day!! Thank you! Yes, Maggie just loved camping! She didn't quite understand what in the world we were doing, but she was all about getting in the tent. I understand about it getting too hot - camping is no fun then! Our s'mores maker came from Sam's club - you can also find them on Amazon. Awh:) You guys are too cute! What a fun idea!